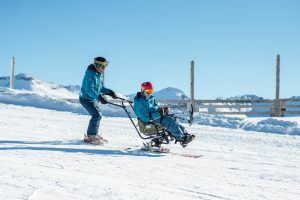 Whether you’re injured, tired or just simply need a break from the incredible ski area, La Plagne’s villages offer a huge variety of activities aside from skiing and snowboarding. We’ve rounded up our favourite 7 on-piste activities in La Plagne so you can truly make the most of your time in the mountains. Take a trip to the top of the Bellecôte Glacier, the highest point in resort at 3417m and visit the Grottes de Glace, or ice caves. Use your lift pass and pay the €8 entry fee to discover the stunning hand-crafted ice sculptures that are created and positioned within the naturally ever-changing caves. Skiers and pedestrians alike can access the wonder of the Grottes de Glace via the Roche De Mio bubble lift from Plagne Bellecôte. Psst: Remember to wrap up warm; it’s pretty chilly in there. Chauffe Marcel, which can be found on the piste between Plagne Centre and Plagne 1800, boasts a beautiful sun terrace with views of Mont Blanc and will be hosting barbeques on the terrace, alongside a menu of local specialities. 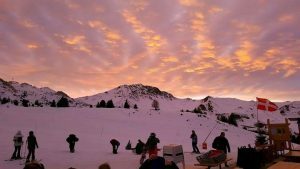 Recently opened by local celebrity and professional slalom skier, Julien Lizeroux, Le Bonnet offers something a bit different, by combining street food and après-ski music in Plagne-Bellecôte. If you’re searching for a seriously unique experience, book into Blacksheep’s igloo village, where you can enjoy fondue from your very own igloo at 2100m. Psst: Why not download the Paradiski YUGE app, which includes a map with directions for all mountain-top eateries and restaurants? If you want to get out on the slopes and enjoy the stunning alpine scenery, simply take a seat and try La Plagne’s taxi-ski service. The closest you’ll get to skiing without clicking into a pair yourself, sit back and keep warm whilst your ski chauffeur guides you down the best runs on the mountain. The routes and speed taken is your call, so you can decide whether you want an adrenaline-filled ride, or would prefer gentler descents that allow you to take in the views. You can even meet friends for lunch in one of the many delicious piste-side restaurants. 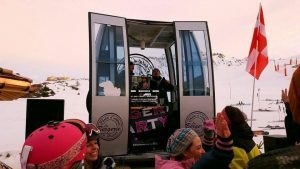 From established favourites such as Scotty’s in Plagne Centre and Bar La Mine in Plagne 1800, to on-piste parties at La Bergerie and the brand new Chauffe Marcel, La Plagne’s après scene is sure to entertain. Possibly the quietest and most peaceful (yet exhilarating) way to enjoy La Plagne and the surrounding valleys is way up above the clouds. Available for pedestrians as well as skiers, Paragliding/Parapenting is a popular activity that allows you to fly through the skies in tandem with a qualified instructor. So, if you wish to escape the crowds and experience the mountain from the ultimate birds-eye-view, check out Laplagnet.com’s paragliding guide and take to the skies today. For an adrenaline rush away from the slopes, La Plagne is home to the bobsleigh track of the 1992 Winter Olympics, which were held nearby – in Albertville. You can ride down the track in bobsleighs at speeds of up to 130 kmph, covering 1.5 kilometres and 19 bends. With several different riding options available, you can enjoy the experience alone or with friends and family, or even in the safe hands of a professional bob racer, who will drive for you. La Plagne is home to not one, but two zip-line courses, including the Cascade and the SuperTyro. Not for the faint-hearted, the Cascade course spans over 1600km through the trees from Belle Plagne to Plagne Bellecôte before offering the chance of a base jump finish. The brand new SuperTyro on the other hand, runs across the valley from Aime 2000 to Plagne Centre at twice the gradient of most zip lines. Flying through the air 140m above the slopes, enjoy an amazingly different perspective of Mont Blanc and the surrounding mountains.